The Rio Grande Water Fund provides funding for projects that accelerate landscape-scale forest restoration, primarily in ponderosa pine and mixed conifer forests. 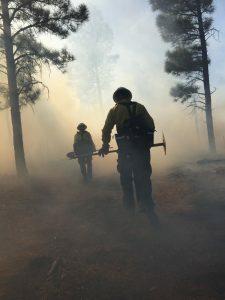 Funding is periodically available for thinning, controlled burns, stream restoration, post-fire watershed restoration, restoration planning, education and outreach, and monitoring. Projects are solicited through a Request for Proposals (RFP) process and reviewed by a Technical Review Panel established by the RGWF Executive Committee. Final Funding decisions are made by the Executive Committee. Through the RFP process, eight projects have been added to the Candidate List and six have received funding. The Rio Grande Water Fund has successfully funded on-the-ground forest restoration projects, tripling the area treated in our forested watersheds. As the RGWF has grown, so has our readiness to expand stewardship activities to include aquatic and riparian habitats. High-severity wildfire has damaged many aquatic habitats within the RGWF. Areas that have not yet seen fire may have altered hydrology or reduced ecological function from other land use activities. The Stream, Wetland and Aquatic Restoration Program (SWARP) seeks to improve the health of aquatic resources, increase biodiversity and restore degraded or damaged areas within the Rio Grande Basin to supplement the forest work and enhance overall watershed health.